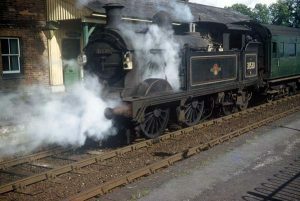 The Hawkhurst Branch Line ran from Paddock Wood to Hawkhurst via Horsmonden, Goudhurst and Cranbrook over a distance of 11 miles and 24 chains, or 18.19 Kilometres. The first section of the line, from Paddock Wood to Goudhurst, was opened for business on 12 September 1892, and the final stretch to Hawkhurst was completed the following year. line from Robertsbridge to Ashford creating a triangle around the Weald but they were not interested in expanding their network. SER preferred to leave any expansion to independent companies using cash raised locally. Then, in 1877, a newly incorporated local company, the Cranbrook and Paddock Wood Railway (C&PWR) secured the passing of the Cranbrook and Paddock Wood Railway Act that authorised a single track line to link Cranbrook with Paddock Wood. SER expressed an interest in supporting construction of the line but only if C&PWR raised a substantial amount towards the cost of the project. Eventually Cranbrook and Paddock Wood Railway reached an agreement with South Eastern Railway. SER would provide £50,000 towards construction but C&PWR would have to raise £25,000 and begin construction of the line before the SER funds would become available. By April 1878 C&PWR had raised only £11,000. Although funds had not increased, preliminary construction work on the section of line from Paddock Wood to Cranbrook began in February 1879, but soon ground to a halt when the C&PWR funds ran out. Undeterred, in 1882 C&PWR obtained a further Act of Parliament authorising the extension of the line from Hartley to Hawkhurst. But landowners in the area were demanding very high prices for their land, which the company could ill afford. In order to save costs the company decided that the stretch of line, originally intended to cover the 2 miles from Hartley to Cranbrook, would be shelved and Cranbrook station would be situated at Hartley. However, South Eastern Railway finally agreed to step in and support the construction of the line but only to prevent their arch rivals, the London, Chatham and Dover Railway, from getting a foothold in what SER considered their territory. Further financial problems meant more delays between 1884 and 1890, by which time SER had taken over the board of C&PWR. SER made several changes to the original plans for the line in order to reduce the cost and so new Acts of Parliament were made. 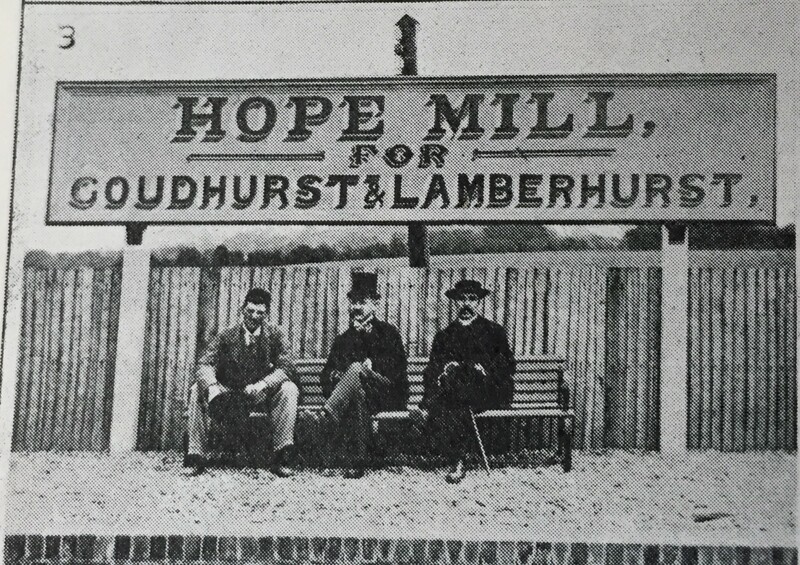 Work restarted in spring 1890 and the section of line between Paddock Wood and Hope Mill, Goudhurst was officially opened on 1 October 1892. 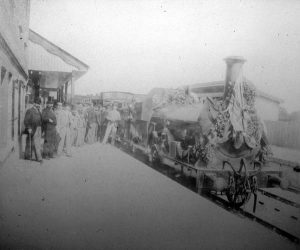 However, the Kent Messenger newspaper had reported on 17 September that the line had already opened to passengers and goods traffic on 12 September 1892 with the first train leaving Hope Mill at 8.25am. All passengers were offered free travel on that day. 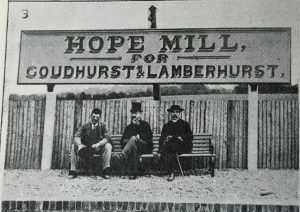 The station serving Goudhurst was called “Hope Mill for Goudhurst and Lamberhurst”. The remainder of the line from Hope Mill to Hawkhurst was completed the following year and was officially opened on 4 September 1893. 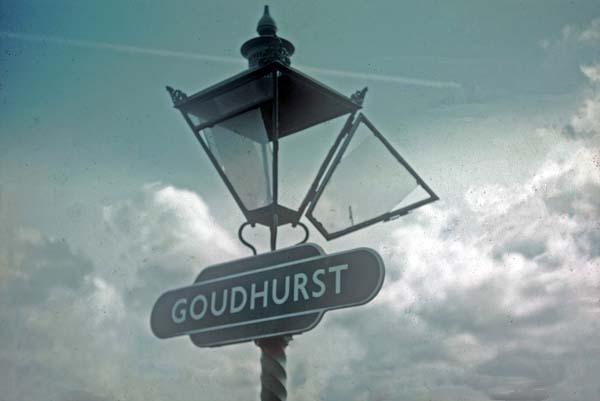 On the same day Hope Mill station was renamed simply “Goudhurst”. The Paddock Wood to Hawkhurst line was single track all the way but with passing loops at all three intermediate stations, Horsmonden, Goudhurst and Cranbrook, but only Goudhurst had two platforms. On 18 February 1948 a train left Goudhurst station heading for Horsmonden. But, the driver had moved off before the points had been changed and the train headed off along the siding. As the train gathered speed, it ran into the buffers at the end of the siding and the engine and first carriage came off the rails. The train came to rest leaning down the bank by Percy Henley’s hop garden and passengers were flung about inside the carriages. Fortunately no one was seriously hurt. 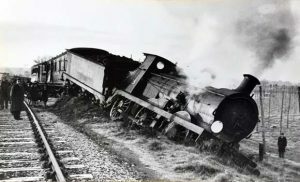 The Courier newspaper printed an article on the accident, which was headed by a photograph taken by Gordon Batchelor, a local resident, who had been travelling on the train and had his camera with him. 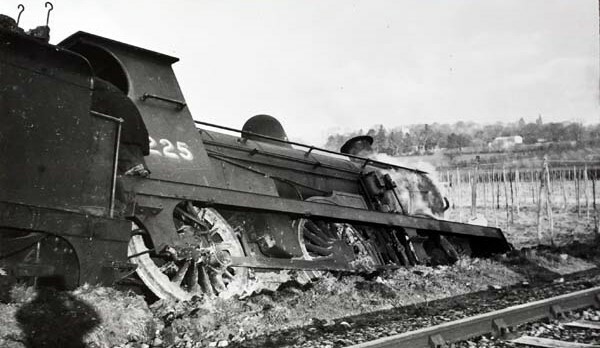 The caption heading the story read, “Coo, Our Train’s Gone Wonky”. Initially there were ten passenger trains to and fro daily on weekdays and two each way on Sundays. Due to the economies imposed by the outbreak of World War 1, the number of journeys was reduced in 1917 to four on weekdays and there was no service on Sundays. After the war numbers gradually increased and in 1922 the timetable shows six trains daily on weekdays but there was still no service on Sundays. Then, by 1925 the daily service had increased to eight trains and, in 1928, a further two trains were added. However, by 1938 the timetable showed numbers had reduced to seven ‘up’ trains and 6 ‘down’ trains daily. The trains were widely used by children to travel to and from schools in Paddock Wood and Tonbridge but this came to an end when Maidstone and District Motor Services were hired to carry the children by bus. 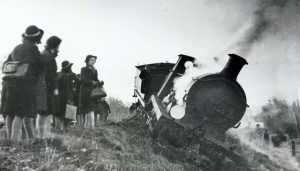 Special trains were put on three times a year to transport boarders from Benenden Girls’ School and Cranbrook Boys’ School at the end of each school term. Some commuters working in London used the branch line but it was not very popular because passengers had to change trains at Paddock Wood and the connections were poor. As time went by more and more people opted to take the bus to Tunbridge Wells and then take the train to London from there. The passenger train services benefited annually from the “Hopper Specials”. Thousands of hop-pickers came to Kent from London in August each year to work on the local farms and special extra trains were put on to carry them. Their luggage arrived first and consisted of everything ‘bar the kitchen sink’. They brought trunks, tea chests, boxes, cases and even furniture. On arrival this all had to be sorted according to the farm it was going to, no mean feat for sure. The various farmers arranged for transport to be at the stations to meet the hop-pickers and to carry them and their possessions to their respective places of work. A few weeks later, when picking was complete, the whole process had to be repeated in reverse. The fare on the Hopper Special in 1929 was just 3 shillings (15p today). But, by the late 1950s, the mechanisation of hop picking and the increasing use of road transport led to a significant drop in the numbers travelling by train. A copy of a letter from Mr Herbert C Bassett, who was employed by the Southern Railway Company and was sent to work at Goudhurst station in April 1943, is printed in the Goudhurst Millennium Book. His letter gives a very amusing description of his experiences at Hop-picking time. Goods traffic on the line was more substantial. Fruit, hops and timber were all carried out and coal was brought into the local area. After World War 2 the carriage of goods by train fell into decline because more and more freight was being carried by road transport. 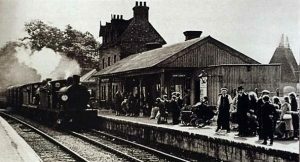 The railways were still used to transport coal and in addition pot plants were carried from local nurseries at Flimwell and Wadhurst for F W Woolworth, a name that has also now disappeared from our High Streets. As many as one million plants were carried by train from Hawkhurst each year, bringing a much needed income of £1000 per week for the railway. In 1948 the railways were nationalised and the line became part of the British Railways network. On 6 July 1950 the Queen Mother travelled on the line to Cranbrook when she visited the National Sanatorium at Benenden. The Royal train consisted of five coaches and the Queen Mother travelled in a Pullman car named Malaga. But, with the declining numbers of passengers, often less that a dozen a day, it was inevitable that the Hawkhurst branch line could not or would not be maintained. In March 1961 the closure notices were posted and the last day of regular services was Saturday 10 June 1961. 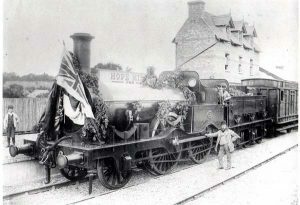 The event was recorded by a BBC cameraman who filmed the 9.07am departure from Paddock Wood to Hawkhurst. 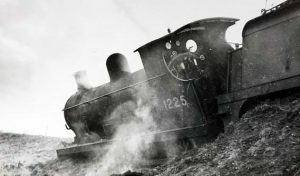 The crew had written on the side of the cab of the engine “Shed no tears for the single track, for perhaps we may come back. And if we do, you can be sure, we’ll see you all again once more”. The last public train on the Hawkhurst branch line ran the following day and the four stations along the branch line, Horsmonden, Goudhurst, Cranbrook and Hawkhurst were closed as of 12 June 1961. 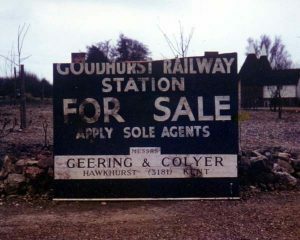 The tracks were removed from the Goudhurst stretch of the line in 1964 and the ‘Goudhurst Railway Station Site’ was sold at auction on Friday 7 July 1967. A house now stands on the site.